Sterling Power Advanced Alternator Regulators allow you to change the standard output of your alternator into a four step charge profile. Our Four Step Battery Charging Profile extends the life of your batteries by fully charging and conditioning your batteries, as well as entering a float mode when charging is complete to protect against overcharging your batteries. Advanced 4 step charging algorithm provides a charging rate that recovers your batteries up to five times faster than from a standard alternator. 12 or 24 volt capability from the Pro Reg-D Advanced Alternator Regulator. Unlike other Advanced Regulator packages on the market our advanced regulators will work with your existing engine alternator. You don’t have to buy a new alternator as part of the installation. No pulley changing, no new bracket building. When installed in conjunction with our ProSplit-R Zero Drop Battery Isolator Product Line, you can provide advanced 4 step charging to all of your battery banks from your alternator, without the risk of any one of your battery banks discharging the others. Four different battery charging profiles are selectable: Open lead acid, closed lead acid, AGM and GEL. Will work with 12 volt system and positive or negative field inputs. Includes a battery temperature sensor to provide battery temperature compensation. 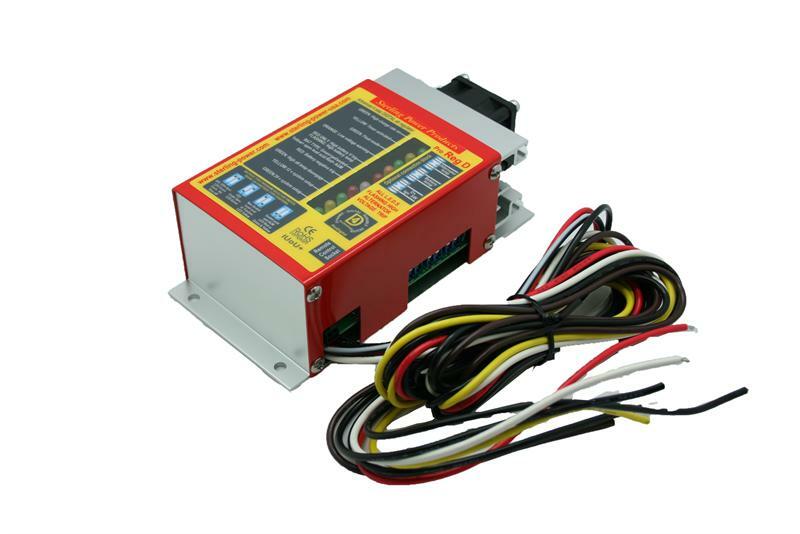 Includes an Alternator Temperature sensor to monitor the alternators temperature. 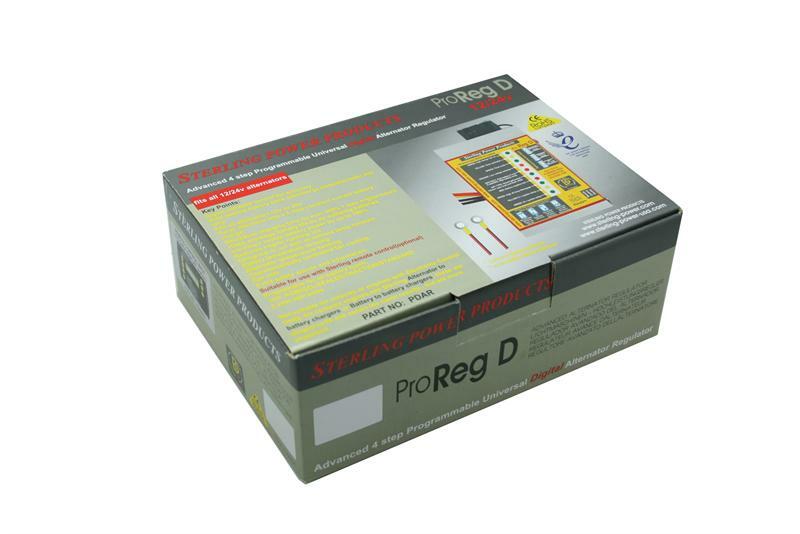 The ProReg-D model has an optional remote that you may purchase from our store. The white wire is connected to a field stud, field brush, or a wire that is connected to the regulator brush within the alternator. The brown wire is connected to the positive alternator output stud. The yellow wire is connected to the ignition lead and turns on power to the ProReg when the vehicle is switched on. The two black wire are connected to alternator or engine ground. The Black with white stripe is connected to battery negative of the battery you are charging and discharging the most. The red wire is a sense wire and should be connected to the positive of the battery you are charging and discharging the most. The red wire could also be hooked to the "sense" stud on a ProSplit-R Zero Drop battery isolator if you are using one of these as well. The system ramps up the current over a short period of time to reduce the chance of alternator belt slip. There are two ways to control electronic processing, Analogue (hardware control) and Digital (software control). Hardware control is where the voltages sensed and processed are all done via transistors and electronic hardware. This is fine as long as the information to be processed is kept simple. However, when producing an Advanced Regulator that will work with all the different battery types, bank sizes and safety parameters, the unit would become almost impossible to function via analog. Sterling leads the field in this type of controller and manufactures a Digital control (software) which uses computer lines of code, digitally burned into a memory processor in the Advanced Regulator. This means that very complex mathematical information can be processed. 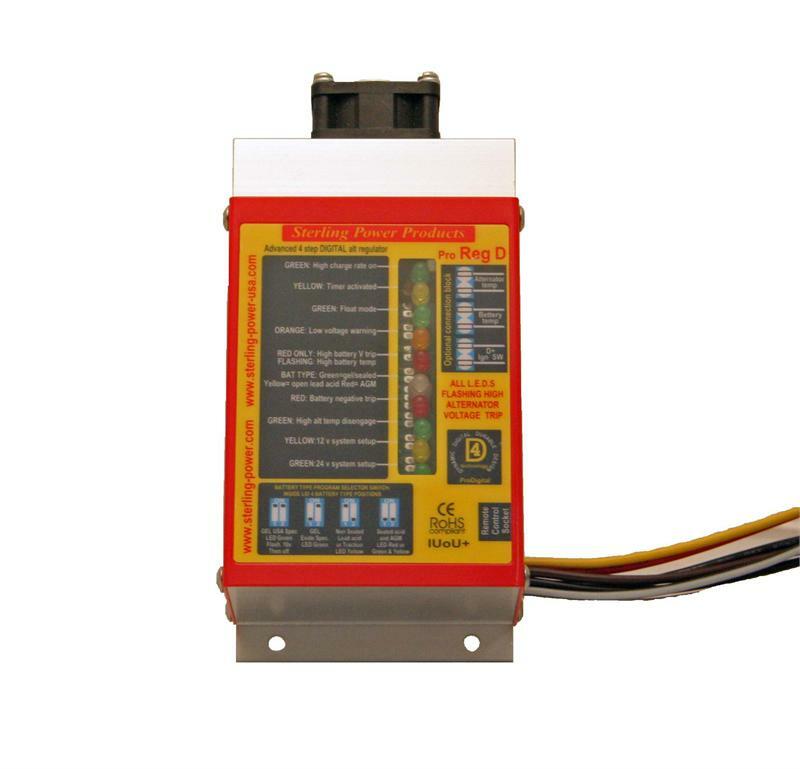 In order to make the new unit truly universal, the one system can be programmed for 12V or 24V operation, a simple link switch is provided to convert the unit. Most other makes of Advanced Regulators are systems which simply run through a pre-set cycle. The Sterling digital system scans all the ongoing processes every two seconds and interacts with the control system to automatically adjust for any changes that may have occurred. This unit can be used as a stand-alone regulator as well as in parallel with the original regulator. The standard unit can be used up to a 24 volt 300 amp alternator in parallel with the alternators original regulator but only about 24 volt 100 amp by itself. However, the new Digital High Performance model is good for at least 24 volt 300 amp by itself if required. There are four main battery types, open lead acid/traction, sealed /gel, gel (Europe) and AGM. To charge these batteries to their best ability there are four different charging curves / temperature curves and safety criteria with each battery type. 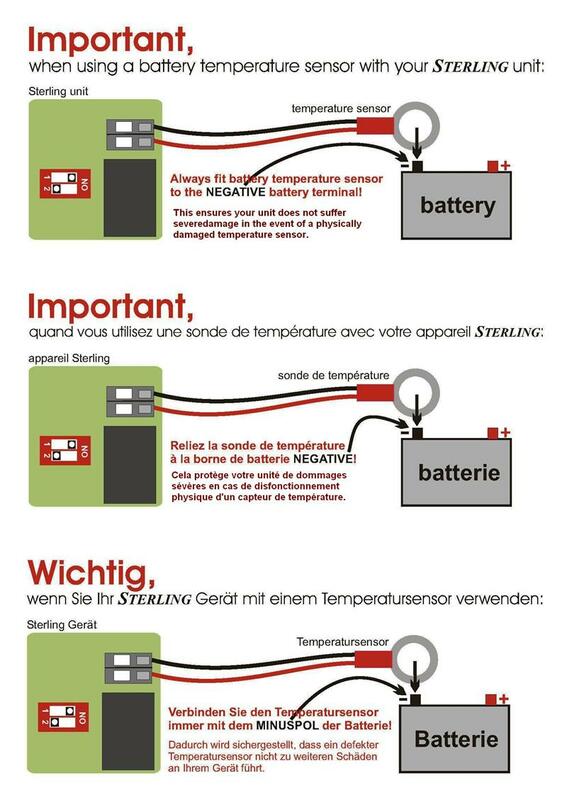 In order to maintain the universal capability of the Sterling-Power regulator, it is important to know the type of battery is being charged. This ensures that the proper charging algorithm is used. These criteria dramatically affect the charge rate settings. After the Sterling-Power regulator has processed the above information, it sets the absorption timer. The end result is a better charge then constant voltage charging and less engine running time. 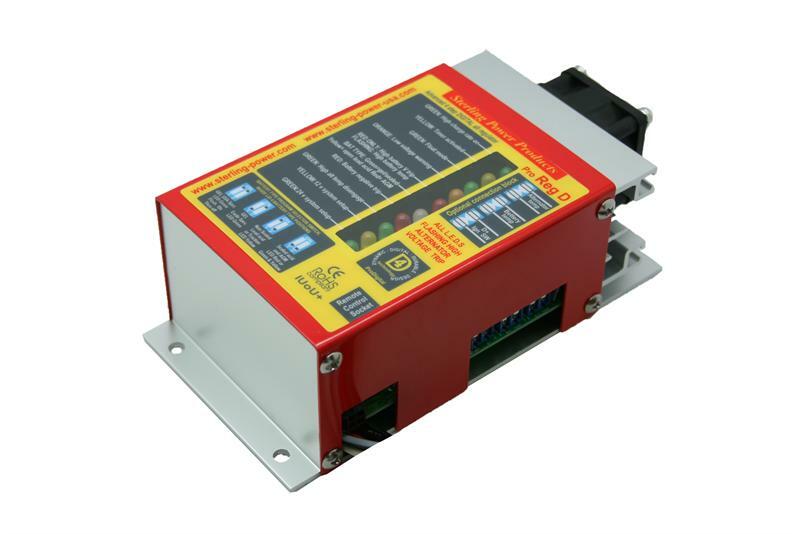 Sterling Power Advanced Regulators fit all types of alternators and batteries so you don’t have to research which regulator you will need. Our regulator will fit both negative and positive alternators and open lead acid, gel, sealed lead acid, or AGM batteries. 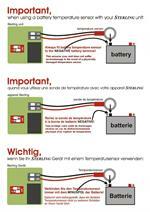 All good battery chargers are constant current 3 – 4 step. This is recognized as the best charging type curves. 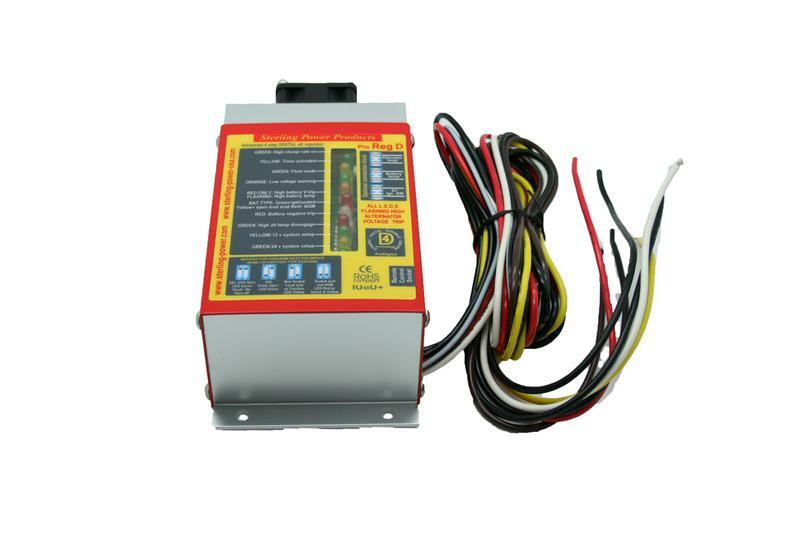 The Sterling Advanced Regulator converts your old fashion constant voltage alternator into a modern 4 step constant current battery charger, it’s that simple. The different battery types require different charging curves. Failure to offer this selection to the customer will result in under achievement of a regulators' potential and the possible destruction of your batteries. The performance and benefits of an Advanced Regulator are beyond dispute, however, an Advanced Regulator, which has been incorrectly installed or fails, can have devastating effects on a boat. It will destroy the batteries and could easily set fire to cables. Sterling takes all this into account and recognizes that some boats on which these regulators are used have poor wiring and other faults. Because of this we scan the system every two seconds and if all the parameters are not within our pre-set values then the unit will switch off and tell you the fault. This in my opinion is the most important aspect of this type of device, a point not shared with our competitors. This is very important as all regulators can fail for different reasons. If an Advanced Regulator fails closed then the alternator will work at full power and destroy everything around itself. Simply turning the regulator off will have no effect, so in the event of a Sterling system failing or tripping, for whatever reason, we physically break the field wire guaranteeing that the Advanced Regulator will stop working. This enables the unit to be used as a stand-alone regulator for such alternators as the BALMAR range of (or any other type in the world), even in the most abusive high temperatures. Sterling Advanced Regulators supply the following information to inform you the consumer so that you have a better idea of what functions your regulator is performing. We are one of the only manufacturers that supply this information. 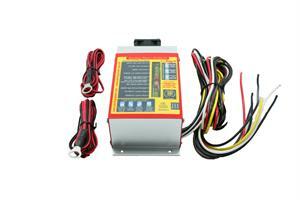 One battery temperature sensor is supplied with the unit. This will adjust the output charging curves with the battery temperature. 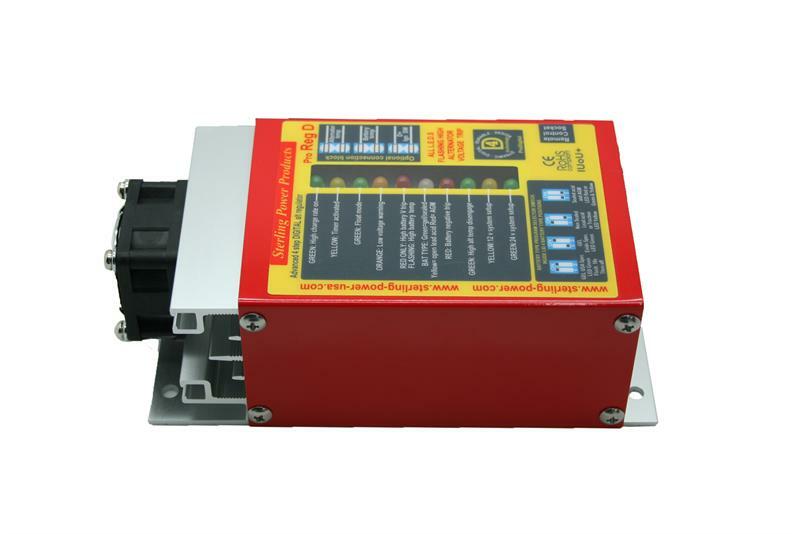 This unit can monitor the alternator temperature and switch off the control unit in event of high alternator temperature. The Advanced Regulator will automatically re-engage when the alternator cools down. Available in ProReg D only. Most Advanced Regulators monitor the battery temperature to perform the task as explained above, but what is the point of monitoring the temperature if in the event of a battery going over temperature you do nothing about it? Sterling software will pick up the high temperature and in the worst case of a battery boiling, will switch off the advanced regulator and display a warning. In the event of the battery voltage going too high the unit will switch the regulator off and display a warning. 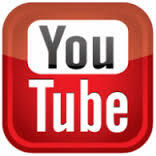 This is the most common trip used. In the event of poor wiring, incorrect installation, or any fault in the system, the alternator voltage will rise too high; the unit will switch the regulator off and display a warning. In the event that any of the alarm functions are activated, it will display a help screen explaining what is wrong and what to look for to correct the issue. There are many good reasons to leave the standard regulator in place, one of them being that, in the event of a Sterling failure or any trip condition of the advanced regulator, your standard regulator will automatically take over and allow the journey to continue but at a lower charge rate. If your Advanced Regulator does not offer this feature then you will lose the use of the boat during any failure. 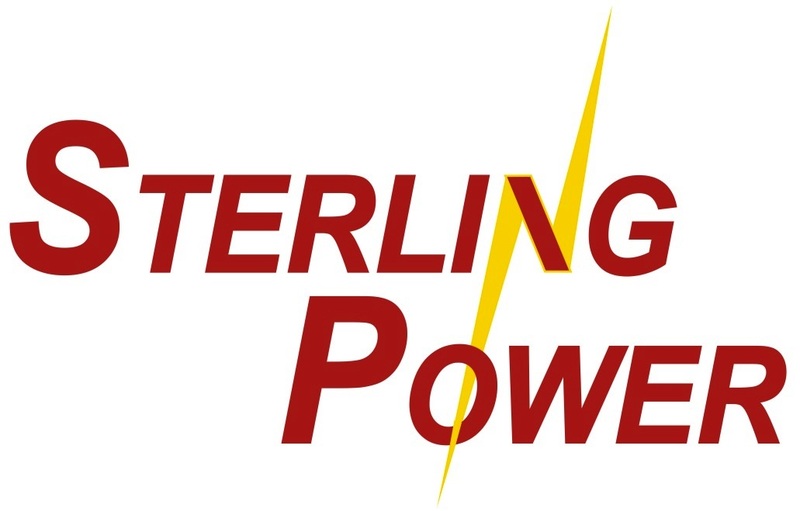 At Sterling Power we leave the choice to you. The software will pick up if you use it or not if you don’t and control accordingly. Sterling always develops product for the ease of the customer. Many people do not like fitting temperature sensors on a batter due to the ability of sensor to break or open circuit. This can cause batteries to overcharge and destroy themselves. Sterling Power Advanced Regulators scan every 2 seconds and adjust the settings to ensure that you are always operating correctly and safely. In the unlikely event of the Advanced Regulator failing then most regulators will fail closed and destroy all your batteries. It is not uncommon for people to change batteries and break the alternator sense wire, as a result the Advanced Regulator has no reference voltage and will destroy all the batteries on the boat, that is unless you have a Sterling Advanced Regulator. It protects against excessive voltage drops in the negative cable. Most Advanced Regulators give a warning or switch off if a fault develops or is already in the positive cable, but the new Sterling also monitors and protects the system from the rarer but just as dangerous faults in the negative cable. Our unit checks the voltage drop from the battery negative and the true negative at the alternator and if the connections are not good or the cables are too thin, then an alarm will sound and the system will shut down.